Part art, part science, sales forecasting can be daunting for new and experienced sales leaders alike. Your sales forecast is required for successful company planning, and when it goes wrong, the dominoes begin to fall: your executives, investors, and even the public may question your credibility. Download now to find out! 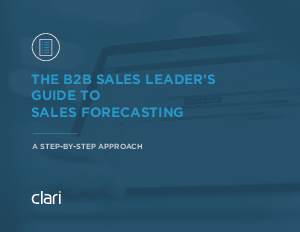 Industry leading companies like Box, Juniper Networks, Symantec, Palo Alto Networks, and Hewlett Packard Enterprise use Clari to drive forecast accuracy and show their sales teams where to focus to close more business, faster. Powered by AI, the Clari platform gives execs confidence in the forecast, makes sales managers better coaches, and puts sales reps in position to crush their numbers every quarter.